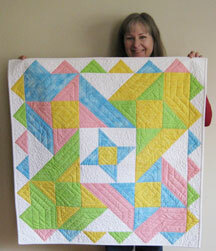 ​​Riverwalk Quilters Guild is very lucky to have so many amazing quilters, designers and teachers as members. This page will not only highlight member challenges, work presented for show & tell at our monthly meetings but also introduce new members to some of the long time members who have a wealth of knowledge and a desire to share it. Get to know our members and you’ll always have a Shop Hop buddy, an honest opinion, and you’ll never be “stuck” because someone always has an answer.Amy Shuter is that kind of a quilter. You might have met her at Pieceful Hearts Quilt Shop where she works one day a week but most probably at a Guild meeting. 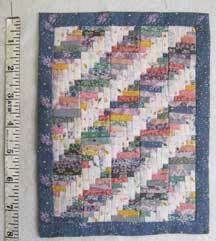 Like many quilters, she’s been sewing most of her life. She started sewing when she was 5 or 6 making doll clothes on her mother’s Featherweight machine. Her talent and skill quickly resulted in receiving a new Featherweight. She grew up in a small town and that was her fun. In grade school and Junior High, she made things for the home, doll clothes and many of her own clothes. ​As an adult, Amy did custom sewing for ten years. She specialized in doll clothes—she would make clothes for American Girl dolls and sell them at Country Sampler Booths. She also did specialty sewing for customers who wanted Bride doll dresses to match the dress of the real Bride clothes for many antique dolls. 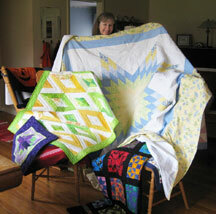 Like most quilters, Amy has her beautiful work stashed all over her house. There are many wall hangings, bed quilts, and her favorite—miniatures! Thank you for sharing all your beautiful work and everyone looks forward to seeing your next Show ’n Tell!